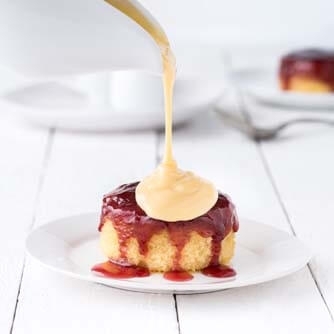 Strawberry Jam oozing over a moist sponge pudding - what's not to love! It can't have been long after jam was invented that someone thought of pouring it over a cake, and ever since those days of discovery the jam sponge pudding has been enjoyed by millions. Ours is all ready to go and simple to prepare, just stick it in the microwave for 60 seconds and turn it out onto a plate!